I have read web articles about predicting height potential, and I have found out that there is a formula on this and it is a bit popular already, I think. If you ask people what is the biggest factor for a persons height?, most would say it is genetically based, means it depends on the genes of the parents. 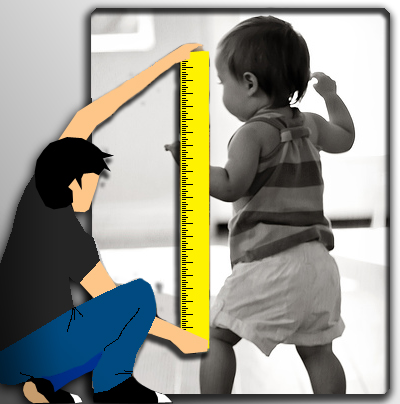 Now this formula of height calculation is based from a person's parents height. Personally I don't believe it is that accurate, but we can try it and see if it is true. Though this isn't that real, still it could help fellows out there who are asking how tall he or she could possibly be, or parents who are asking how tall their child would be in the future. Here is the process. Step 1. Add parent's height(you can use inches or centimeters). Step 2. Divide the result by 2. Step 3. Then for boys add or subtract 4 inches to the result, for girls add or subtract 3 inches. The child's height could possibly within that range. After calculating, was the formula accurate to your height? Was it at least close? It wasn't extremely far off for me, my dad is 69 inches and my mom is 60, so it said I would be 64-67 inches, but, I'm about 70 inches. haha.